Scuba Diving, Travel, Steam, Photography. Some may remember my arrangement for an iBoost. No damage, van Lunar with aluminium panels. Start by sacking the wife! Smiles. Sounds like you're going to be busy. Hope everything goes well and you have many harmonious and exciting holidays in the van. Nah! Wast of time pointing anything out. Quote " So who cares what they think as I don't?" Mind made up. Bit like the "red lines" May has tried not to cross. My Belgium friends jokingly asked if I wanted to move to their bit of the world a few days ago. I say jokingly but in reality from pity. I think the point is - shown clearly on the graph - that the value fell dramatically during 2016 as a direct result of Brexit. It has remained at the end of 2016 low for the past couple of years. I can only admire the time and trouble some go to in order to watch UK TV abroad. Really not necessary you know. - honest. I watched a guy a few years ago hold a sat dish to his chest and walk around the van. Window open with wife inside ready to stop him if he got lucky. So far as I remember he gave up! I wonder if he ever made it? And this is true - not made up. Came back from Bourges (Vierson) last year and did exactly this (Round Orleans on the A10) I too would suggest you consider it. From Chartres we followed the route you have shown with easy driving throughout. Afterthought. Interested to note you skirt London to the South! We've always headed for Dartford after the M1. Disgusting journey either way especially after the space in France. The serried ranks of CMC sites smack of anything but the freedom camping should bring. Maybe most commercial sites suffer from a similar malaise but for us CLs and Red Pennant are the ONLY reasons we belong to any so called "club". Janine, Lady Bird - you would be most welcome parked next to us no matter what type of site we were on. But from experience here I have to say that the "official club sites" of the CMC do not ooze friendliness. We use them only if no alternative available. It's so different abroad. There you find vans, motor homes of all ages and not a soul cares a fig! You generally park how you want and often where you want within reason. Not like here in one of the "club" sites. Move that peg if you dare! I suspect it has something to do with pride of ownership. The widest and the biggest with every convenience known to man including automatic satellite dishes, self levelling gizmos and 4 litre cars to pull them (in the case of caravans), has raised "camping/caravanning to a status symbol for some. Not so in Europe for the most part. I sometimes wonder why the CMC magazine chooses to feature leisure vehicles that most people would need a second mortgage to buy - and in the case of motor homes, run. Camping is about freedom not elitism. Well - it should be in my book. Not for one moment am I suggesting we should all be "one happy family" but hands up those who have never wondered why no smile or wave from a neighbour has been forthcoming! Our experience abroad is that in most sites a chat with a neighbour has always been welcome and never have we felt out of place because of our possessions. Of course after Brexit nothing will change! Why not check on Google maps for the car park or exact spot you want to visit, right click on the map in either map mode or satellite mode and select "What's Here". (whilst you're at it "drive" any dodgy looking sections to check all good). Simply add these coordinates to your Garmin and save as a favourite. You can later edit it and pop it in a more meaningful category if you wish - you can, of course, make your own category if required. This method will take you exactly where you wish to go. Selecting random street names and house numbers or whatever will not. All you can be sure of with that procedure is getting to somewhere in the town. That's interesting. I always believed that tyres stored properly would not deteriorate within reasonable periods (say a couple of years) and that the estimated life started from date of fitting. The rate early 2016 was on a par with 2004 to 2008. It rose steadily from 2009 until 2016 as you can see, Notice the sharp decline throughout 2016? Nothing whatsoever wrong with your brain or your fingers Janine. Was just curious to know what you were meaning. Good to hear that you are sharing your expertise with your local council too. Without mentioning any topical debate - if you can stretch a point and call it a debate - there are many of us who have lost faith in politicians. The "elected members" point certainly applies to many at the moment - decisions/allegiance etc swayed by personal and political gain and not the future of our country. I hope your husband's parents were not caught up in the recent scandal too. Do you think the Councils have been caught out then? Are we talking about recent residents or those born and bred in the UK? Just a tad confused as to who you are talking about? The "now" seems odd! HaHa Wonder if you need wellies to walk around the place! Can just imagine the dogs barking, the kids playing football, the parents drinking mainly because they either can't get out or dare not get out for fear of holidays ending! Beggars belief. The pic below shows that a simple barrier can end the pollution caused by motor home "parasitic" parking. 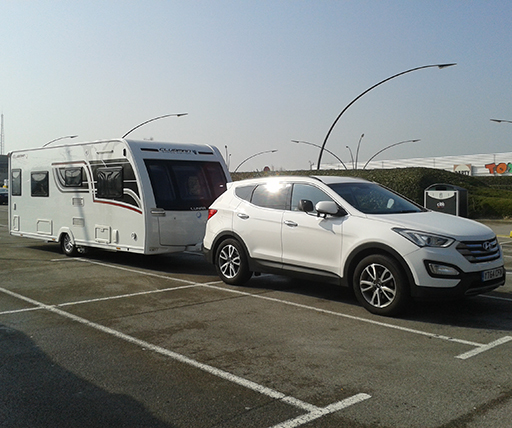 This is in France where motor homes have countless parking specifically set aside for them. The number of times we have paid for our site and gone out in the car only to find parking with no height restriction frequently being used by the motor home fraternity, canopy out, vehicle levelled and chocked. Not just a few hours parking. Pic shows the benefit of a barrier in popular areas. Don't they have camp sites you could pay to use?